INTRO FROM CASS WARNER'S "THE BROTHERS WARNER"
a film by Cass Warner (founder of Warner Sisters & granddaughter of Harry Warner, one of the original four Warner Brothers). WELCOME TO THE WARNER BROTHERS CELEBRATION PAGE!!! To ALL who participated in A WARNER SUMMER .. thanks! Hopefully your eyes have been broadened, & your heart inspired, by the limitless dreams & visions of the four brothers. Because I HATE to see a wonderful thing end .. (I'm guushhy like that)... 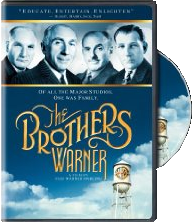 I have purchased another copy of Cass Warner's (granddaughter of the head Warner Brother, Harry) great film .. 'The Brothers Warner,' and will be giving it away August 28th..2010. Deadline to get your name in is midnight of August 27th, 2010. Hollywood Legends.net accepts no liablity for items that may be damaged during transit. By entering this contest, you release Hollywood Legends.net to use your name, should you win! Good Luck !! By clicking here to enter - you agree to the above terms.